An elegant Highway Code – from ants? Posted by Oliver Payne | ants · Biomimicry · Cars · Highway Code · Nissan · Traffic | The Hunter Blog | No Comments on An elegant Highway Code – from ants? It’s not often you get taught a lesson about how to drive efficiently from a bunch of ants – so buckle up, literally. At the Department of Biological Sciences in the Monash University, Melbourne, Australia they’ve been studying the traffic dynamics of the leaf-cutting ant (Atta cephalotes, if you’re interested). 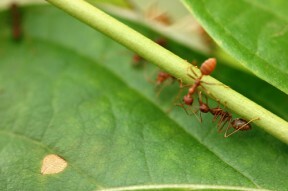 The rate at which ants can get in an out of the nest is “likely to be closely tied to colony-level rates of resource acquisition”: The more efficiently they can get food the more of them can live. So, we can be sure they have a pretty good reason to get the flow rate of traffic correct – imagine ‘It’s a Knockout’, but with death for your team-mates if you fail. They found that “maximum flow rates… occur at a relatively high concentration that keeps individual speeds well below their “free flow” maximum.” Bad news for boy racers everywhere: slow and steady is better for the greater good. Why? This can’t be correct? The boffins at the Department of Biological Sciences found that when ants couldn’t overtake each other the ant traffic flow delivered more ants per minute than if they’d let them go nuts on a 2-lane ant highway. So if we could deliver a line of cars on the motorway travelling close together in single file – like the ants – we could make traffic flows more efficient. And efficient always means less expensive – less expensive fuel bills, and a less expensive drain on finite resources. Surely this isn’t beyond us? Nissan have a Distance Control Assist System. They launched it a few years ago. It’s able to “determine the following distance of the driver, as well as the relative speed of both cars”. It does this with a radar sensor installed in the front bumper. A kind of four-door ant. They aren’t the only manufacturer to develop a similar system – in fact almost all of the (dwindling number) of majors do. Isn’t it time we all drove like ants? Citation: “Traffic dynamics of the leaf-cutting ant, Atta cephalotes.” By Burd M, Archer D, Aranwela N, Stradling DJ, University of Chicago Press, 2002 Mar;159(3):283-93.